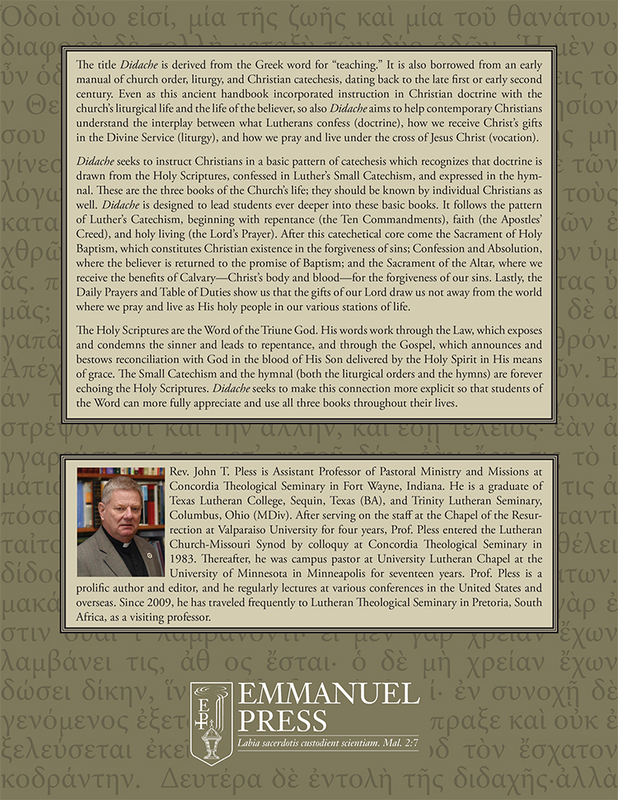 From the back cover: The title Didache is derived from the Greek word for “teaching.” It is also borrowed from an early manual of church order, liturgy, and Christian catechesis, dating back to the late first or early second century. Even as this ancient handbook incorporated instruction in Christian doctrine with the church’s liturgical life and the life of the believer, so also Didache aims to help contemporary Christians understand the interplay between what Lutherans confess (doctrine), how we receive Christ’s gifts in the Divine Service (liturgy), and how we pray and live under the cross of Jesus Christ (vocation). Didache seeks to instruct Christians in a basic pattern of catechesis which recognizes that doctrine is drawn from the Holy Scriptures, confessed in Luther’s Small Catechism, and expressed in the hymnal. These are the three books of the Church’s life; they should be known by individual Christians as well. Didache is designed to lead students ever deeper into these basic books. It follows the pattern of Luther’s Catechism, beginning with repentance (the Ten Commandments), faith (the Apostles’ Creed), and holy living (the Lord’s Prayer). After this catechetical core come the Sacrament of Holy Baptism, which constitutes Christian existence in the forgiveness of sins; Confession and Absolution, where the believer is returned to the promise of Baptism; and the Sacrament of the Altar, where we receive the benefits of Calvary—Christ’s body and blood—for the forgiveness of our sins. Lastly, the Daily Prayers and Table of Duties show us that the gifts of our Lord draw us not away from the world where we pray and live as His holy people in our various stations of life. 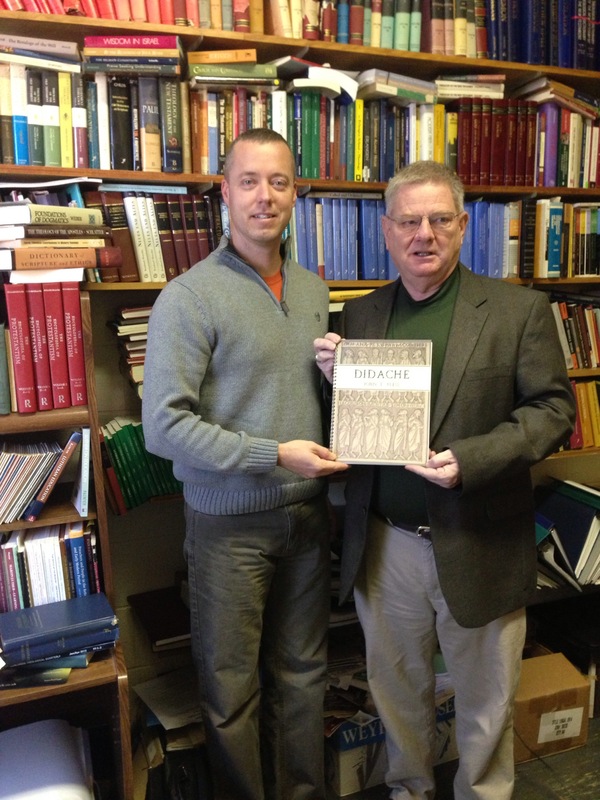 The first edition of Didache, published in 1992, has been used throughout the United States and around the world for adult catechesis by both pastors and laity. Many pastors have found it useful in instructing adults in the Lutheran Confession of the Christian faith, and laity have found it to be a helpful study guide into the Holy Scriptures. There are numerous Scripture references in the margins along with ample space for note-taking. This updated and expanded edition of Didache follows the contours and content of the first edition, with liturgical references updated to reflect Lutheran Service Book. Some sections have been expanded, and there are also new additions: a bibliography of catechetical resources, an essay on the Catechism, and a Scripture Index. 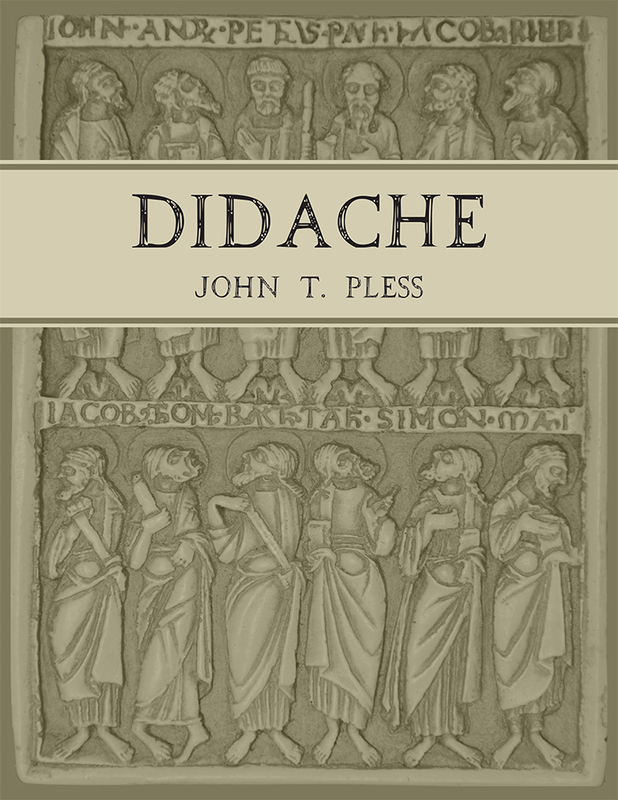 Didache is currently at the printer, and we expect it to be available by the end of the month. It is reasonably priced at $12.00, with discounts for bulk orders. “Like” us on Facebook or sign up for email updates (both are located on the right sidebar) to keep up to date on its release!